You probably don’t know this about me, but I love big birds. I am always on the lookout for an owl, eagle, osprey, hawk, or other ginormous bird. I was up on the 15th floor of a Panama City Beach condo last week on assignment for a story on a new condo tower that may be built near Pier Park. As I was photographing the area, my spider senses kicked in and I looked up to see a large bird chasing another large bird. I quickly switched from my 16-35mm to my 80-200mm zoom lens to get a better look. When I saw white tail feathers my heart skipped a beat. An eagle! 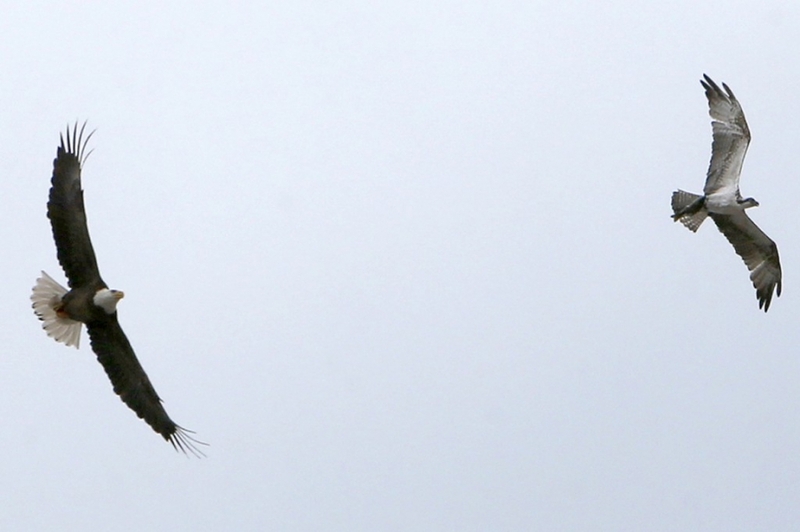 I began taking photos and realized that the eagle was trying to steal a fish from an osprey. I did the best I could with the lens I had on me at the time and snapped off a few frames before the birds went to the other side of the tower and out of sight of my camera.